The first place on the 2015 tour we’ll have a look at is Chemnitz. Located in western Saxony near the Ore Mountains between Dresden, Hof, Leipzig, Zwickau and Glauchau- in other words, smack in the middle of all the action, Chemnitz was first recorded in the 12th Century when Kaiser Lothar III established the Church of St. Benedict. The city plan of the town was presented over a century later. The city’s origin comes from the river running through it, whose name was derived from a Sorbian name meaning stone. 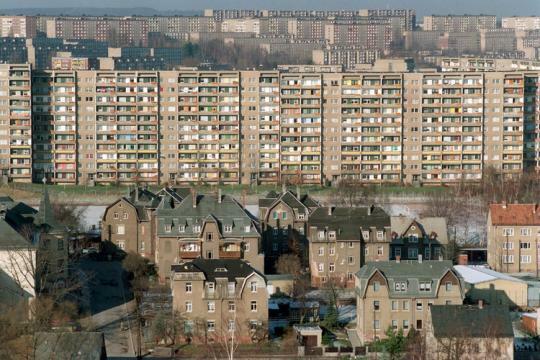 The city was substantially destroyed in World War II and the people suffered a great deal afterwards, as it became part of the Soviet Zone, and the city was subsequentially renamed Karl-Marx-Stadt in 1953, named after the founder of Socialism. Like many cities in the former East Germany (German Democratic Republic), the cityscape was transformed rapidly over the next 30 years, as architects placed high rise after high rise wherever the Socialist Party (SED) pleased. That is the reason why the city center and its churches surrounding them are flooded with more high rise buildings than necessary. Can you imagine looking at the city without these concrete slabs just for a second? Chemnitz Central Station: looks like an East German gym for sporting events. One needs to subtract the tracks and the platforms. 1990 and the people, fed up with the importance of Marxism and Leninism, were granted their wish, and the name Karl Marx Stadt was converted back to Chemnitz. Yet much of the architecture from the East German period remains today, and people can see them while driving past, especially the statue of Karl Marx at the corner of Brückenstrasse und Street of Nations. Even the Central Railway Station, despite its lounge looking more modern than 25 years ago, looks like a hangar gleaming with yellow sodium lighting. If one takes away all the platforms, it would resemble a sports center, with a wrestling ring and matches featuring the likes of Velvet McIntyre and Mathilda the Hun, two of the many professional wrestling stars during the 1980s. Yet it could also look like an ice skating rink, featuring the likes of Katarina Witt, Germany’s beloved figure skater who was born in the city. However more modern architecture is popping up in an attempt to drown out the architecture the SED wanted there at any cost. This includes the expansion of the Technical University in Chemnitz, where because of the increase in students, the campus has expanded to the south, thus leaving the former main campus next to the train station with a purpose of having extra space for classes. Check your Googlemaps app if you have an appointment at the TU, to ensure you are at the right campus, please, or you will certainly get lost. Yet despite the concrete settings, which resembles the scenes from the dystopian film The Cement Garden, Chemnitz has several features that standout. The city has the Opera House, Roter Turm at Neumarkt, historic buildings at Schillerplatz and several museums focusing on technology, archeology and art, as well as churches and castles. Even the river Chemnitz features many parks and historic bridges, namely the Railroad Viaduct built in 1884. And lastly, the city is famous for its Christmas market. Located in the city center at Neumarkt, the market is laid out in three areas: Between the apartments along Am Neumarkt, between the Old and New City Halls and at Roter Turm. Yet, getting there from the train station or other parts of the city, thanks to the maze of concrete one has to go through, takes lots of navigating, regardless of what kind of Verkehrsmittel a person uses. In my case, despite having my bike companion Galloping Gertie, which always gets me from point A to point B, my sense of orientation was lost in the concrete. So to the city council officials who want a word of advice from me: signpost the directions to the market next time, please! Barring the author’s critique, I was told that the city had won the prize for the best Christmas market in Saxony. Given the architecture that drowns out the historic nature of the city center- at least the ones that were built before 1914, it was hard to believe at first glance. But then again, learning from my visit in Halle (Saale) and its Christmas market in 2012, one cannot judge the book by its cover but should read the first few pages before making the first judgements. This was why I wanted to take an hour to look through the place. After fighting through the concrete maze, my first stop was at Neumarkt. Located adjacent to the Roterturm, the market is the second largest of the city’s Christmas market. Visitors are greeted with the black gate, flanked with Christmas angels holding candles and a large black Schwibbogen, resembling the miners and angels. As mentioned in a previous article, the color of black represents the color of the ore found in the Ore Mountain region, the birthplace of the arched candle-holder. To the right is another typical Christmas figure found in the households in Germany, the Pyramid. More on that in a later article. The market is at the doorsteps of two major shopping centers, one of which is named after a popular historic landmark, Der Roter Turm. Built in 1230, the tower served as a watchtower overlooking the town as its original purpose. It was later a watchtower for the prison complex, which existed in the 17th to the 19th century. It later became a gateway, welcoming people to Chemnitz before it became a historic landmark in the 1990s. The shopping center, located next to the tower, opened in 2000, mimicking the architecture of the tower and the adjacent city hall. Going left one will find the rest of the market and then some, located at the Market Square. The one at the Alte Markt is the largest and features the Christmas tree and the Spielwerk, a Christmas merry-go-round-like featuring Santa Clause, an Angel, a Snowman and gifts. Counting the extension along Rosenhof, which has a line of huts, the markets are surrounded by apartment complexes from the GDR era. Judging by the appearance, these modernized apartments are well occupied, which means the families have front-row seating on each floor, especially during the holidays. A Christmas market surrounded by high-rise flats. When looking at the huts, one can see a unique uniform pattern- namely gabled huts with mahogany siding. The color is typical of the wood found in the Ore Mountain region, and most of the products sold at the market- whether they are Räuchermänner, Pyramids, Schwibbogen or even figures for the Christmas tree, are handcrafted with this unique type of wood originating from the region. Add the red and white lining and lettering and the place looks really Christmassy, even without the snow, as I saw in my visit. Admittedly, it would make the market look really romantic with the snow, even viewing it from the apartments above. Das Spielwerk at Altmarkt: another typical feature coming from the Ore Mountain region. Most of the huts are lined up into long rectangular islands with the backs to each other. The purpose behind that is to provide more space for people to maneuver towards the stands without the feeling of being crowded. Despite having to fight a maze to get to there, the market itself is rather spacious, enabling the people to move around more freely than in some markets visited until now. That means between rows, the width is equivalent to the width of 3-4 cars, pending on location. Lots of space and less risk of injury by pushing and shoving, or even getting smacked in the face with a heavy backpack. It’s lesson that markets in some cities, like Dresden and Nuremberg should take note, even though the problem with the former is with the Striezelmarkt as Neustadt has a concept similar to this one. Typical Christmas market huts with lots of space. The market also offers delicacies from the Medieval Ages and from different countries, many of which can be found at the market in Dusseldorfer Platz, whose setting matches the Middle Ages with dark-colored huts covered with darker-colored roofs. This includes the Turkish specialty that sells kebaps and kofta.Koftas are mini hamburger patties with special spices imported from Turkey. When placed in a pita bun and adding all the fixings, they look like the typical kebap but without the sliced meat. Yet they taste like Jennie’s Grinder, a submarine sandwich found at the Iowa State Fair. And like the sandwich, the kofta is best eaten hot. Taking it to go will mean the loss of taste when it is even lukewarm. This was a lesson I learned upon buying it at the booth to take for the trip home. But in any case, the kofta is one that is recommended if one wants something spicy at the market.